The results of the survey suggest that a number of member states – including France, Greece, Italy, and Slovenia – have become more confident in the safety of vaccines since 2015; while Czech Republic, Finland, Poland, and Sweden have become less confident over the same period. In some countries anti-vaxxers have a stronger foothold, and are actually decreasing acceptance of vaccines. But there are two other trends that are more disturbing. First, in the countries with decreasing vaccine acceptance there is high levels of vaccine skepticism among general practitioners. While GPs generally hold higher levels of vaccine confidence than the public, the survey found that 36% of GPs surveyed in Czech Republic and 25% in Slovakia do not agree that the MMR vaccine is safe and 29% and 19% (respectively) do not believe it is important. Those are shockingly high numbers for physicians. This is one of my greatest fears about the advance of alternative medicine and anti-scientific medical views – that they will affect the medical profession itself. Once unscientific ideas creep into the culture of medicine, the game is all but lost. This is why teaching pseudoscience in medical school is such an alarming problem. In this survey, the countries with higher levels of GP vaccine skepticism, had higher levels of public skepticism and lower levels of vaccine compliance. I am what is known as a mild protan. That means that the cones of my retina that perceive red and green wavelengths are not as separated in their frequency response as they should be. This overlap causes some shades of red and green to look similar. As far as I am aware, the only deficit this has caused in my life is the inability to see some of those numbers in the circles of colored dots used to test color vision. Although some color combinations, such as the orange and green of the Miami Dolphins jerseys, are uncomfortable to look at. But other people have more severe forms of color blindness that can actually affect their lives, such as the ability to distinguish red and green traffic lights. I was therefore intrigued on a personal as well as scientific level when I first heard the claims for glasses that can compensate for some forms of color blindness. To me the claims sounded only semiplausible. The problem with partial color-blindness is in the cones – the retinal cells that perceive color – so how could you correct this by simply filtering the frequency of light? But I left open the possibility that by specifically altering some colors you could enhance their separation, making them easier to distinguish. Yeah – so do sunglasses. This is a clever implied claim here, without actually making a specific claim. They also present reviews on their site, quoting other people who make more profound claims. This is the common “testimonials” approach – let other people make the claims so you don’t have to. My favorite fossil is the Berlin specimen of Archaeopteryx lithographica, for several reasons. First, it is straight-up a beautiful fossil, well-preserved, and just a natural work of art. But this is no object of human creativity – it is also a wonderful transitional fossil, catching evolution in the act of transforming theropod dinosaurs into birds. There is a cast of the Berlin specimen at the Peabody museum in New Haven, and it is capable of capturing my attention even in the middle of the hall of dinosaurs. Recently I was able to visit the Natural History Museum (NHM) in London – where they have the original fossils of the first Archaeopteryx specimen found in 1861 (before the Berlin specimen), making it the type specimen. It too is beautiful, showing both the plate and the counterplate – the limestone that contains the fossil was cracked open, revealing impressions and fossils on both sides. You can clearly see the feather impressions surrounding what at first looks like a small theropod dinosaur. On closer inspection, however, there are bird-like features as well, but retaining things like teeth and a long bony tail not seen in birds. Again – a dramatic transitional fossil, clearly connecting birds to what are now called non-avian dinosaurs (because birds are dinosaurs). Creationists have long tried to argue that Archaeopteryx is not transitional, just a weird bird, but the evidence is undeniable. It has as close to halfway features between walking theropods and modern birds as you can get. But to be clear, Archaeopteryx is not on the direct line to birds. It is a side branch from a period in time when small feathered dinosaurs were undergoing adaptive radiation, only one branch of which would lead to modern birds. This is always going to be the case, however, and does not diminish the transitional significance of this species. Also, in recent decades a number of feathered dinosaurs have been discovered, fleshing out much of the evolutionary pathways between theropods and birds. I see this all the time. In fact, this kind of thing is now the rule rather than the exception. Someone wants to stay healthy, or get more healthy, and generally take responsibility for their health, so they engage in a list of healthful lifestyles. Unfortunately, some or most of the stuff they are doing is either worthless or even counterproductive. It seems the more motivated they are to engage in healthy lifestyles, the more they fall victim to pseudoscience and nonsense. Welcome to the “Wellness” industry, which is really an industry of lies, nonsense, pseudoscience, and exploitation. If you are lucky, you will come away from your encounter with the Orwellian-named wellness industry with the only harm being financial. If you are unlucky, your health will be harmed as well. Jim McCants is now the latest poster child for being a victim of snake oil. At 50 he decided to get more healthy, so that he would avoid his father’s fate, who died at 59 of a heart attack. As part of his regimen, he started taking green tea extract. Why? Because it was marketed with all the usual claims built up by the snake oil industry – it’s “natural”, it has anti-oxidants, it helps detox – all utter nonsense. But it’s a good story, and Jim bought it. Why not – the vast majority of the public buys it, because it has been endlessly marketed to them. Gurus like Dr. Oz support this pseudoscience with apparent authority. Doctors, scientists, and academics pay far too little attention to it, and so the claims largely go unchallenged. The regulatory bodies have also been rendered largely powerless against these cons, partly by design. The supplement industry, through their generously compensated representatives like Orin Hatch, have gutted the FDA’s ability to protect the public from snake oil. One of the frustrating aspects of how science is reported in the mainstream media is when a complex study with very unclear results is presented with a misleading bottom line. Most people read only the headline, or perhaps the first paragraph, in order to glean the essence of a scientific study. They don’t read deep into the reporting to find the important details, or go to the study itself. This is especially problematic when the study is of a preliminary design, or when the author’s conclusions are biased or misleading. The most recent example of these issues is a study looking at the consumption of organic food and the risk of cancer. CNN reported the study as showing: “You can cut your cancer risk by eating organic, a new study says.” No – that is not what the study shows. The study itself is not bad, for what it is, but it is highly limited in the conclusions that can be drawn from it, and it has some serious limitations. The researchers looked at a French database of good consumption, NutriNet-Santé Prospective Cohort Study. They had volunteers fill out food diaries for three days, report their organic food consumption, gathered demographic and other lifestyle data, and then followed them for over four years, using various methods to track the incidence of cancer. In testimony before congress, Mark Zuckerberg predicted that artificially intelligent algorithms that will be able to filter out “fake news” will be available in 5-10 years. In a recent NYT editorial, neuroscientist Gary Marcus and computer scientist Ernest Davis argue that this prediction is overly optimistic. I think both sides have a point, so let’s dissect their arguments a bit. Fake news is the recently popular term for deliberate and often strategic propaganda masquerading as real news. There is, of course, a continuum from rigorous and fair journalism to 100% fakery, with lots of biased, ideological, and simply lazy reporting along the way. This has always existed, but seems to be on the rise due to the ease of spread through social media. Accusations of fake news have also been on the rise, as a strategy for dismissing any news that is unwanted or inconvenient. Obviously this is a deep social issue that will not be solved by any computer algorithm. I would argue the only real solution is to foster a well-educated electorate with the critical thinking skills to sort out real from fake news. That is a worthwhile and long term goal, but even if successful there will always be a problem with fake news, regardless of the medium of its spread. The real context here is the role that social media serves in spreading fake news. The reason that Zuckerberg, the creator of Facebook, is involved is because Facebook and other social media platforms have become a main source of news for many people. Further, they represent a new model for pairing people with the news they want. The traditional model is to build respected news outlets who cultivate a reputation for quality and have a heavy editorial policy that filters the news. People then go to news outlets they respect, and get whatever news is fed to them, perhaps divided into sections of interest. But even this model has always been corrupted by ideologically biased editorial policy, and by sensationalism. You can attract eyes not only through well-earned respect by providing quality, but also by sensational headlines, or by catering to preexisting world-views. Neanderthals were our close cousins. They are the closest species to modern humans that we know of. There is also the Denisovans, which are currently classified as a subspecies of Homo sapiens, but may eventually be classified as their own species. Neanderthals lived from 400,000 to 40,000 years ago. They spread out of Africa, and throughout Europe and Asia. When modern humans arrived later, there was some clear interbreeding going on – Europeans and Asians have about 2% Neanderthal DNA. In fact a recent study suggests that modern humans specifically retained Neanderthal genes that conveyed improved resistance to European viruses. The first fossil specimen of Neanderthal was discovered in 1829, although this was not recognized until later. The first recognized specimen was collected in 1856 in the Neander valley in Germany. This was the first early hominid specimen found. Perhaps because of the time it was discovered, our image of Neanderthal is still colored by the notions of the day. “Primitive” was synonymous with brutish and animalistic. As an American it’s very easy to look at issues from a narrow American-centric view (we have a well-earned reputation for this). I am often reminded of this by my many international SGU listeners, and I have had to discipline myself to keep this in mind. This news follows the astonishing statements made by India’s minister for higher education earlier this year. Satyapal Singh claimed Darwin was “scientifically wrong”, and is demanding that the theory of evolution be removed from school curriculums because no one “ever saw an ape turning into a human being”. India has 1.35 billion people, which is 17.7% of the world population. (China is 1.4 billion, 18.5% – so India and China combined have 36.2% of the world population). I think it’s reasonable to say that it matters what happens in these countries, especially with our increasingly globalized world. Our efforts to curb climate change depend on cooperation from China and India, and having a scientifically literate population will help these efforts. This has been a two year project, and was as much work as I thought it was going to be. It took about a year to write from first conception, and then another year to go through the publishing process. My final task was recording the audio version, which took two weeks, and I completed just two weeks ago. 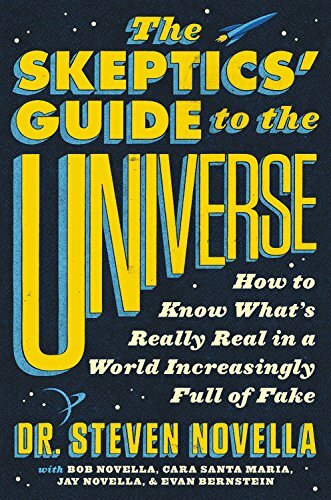 The book is intended to be both a primer for someone new to the world of scientific skepticism, and also a thorough reference even for experienced skeptics. We tried to make it as light and fun to read as possible, while also being dense with facts and concepts. Early reviews suggest we were reasonably successful. I say “we” because I have four co-authors on the book, my fellow rogues at the SGU. They provided some of the first drafts of chapters, although I did the final edit to keep the book in a consistent voice and narrative. Regular readers here will certainly find the subject matter familiar. The book is largely based, in fact, on this blog, and I thank the many regular commenters here for contributing to the conversation that has informed my writing over the years. Writing a book, however, is very different from writing a blog, I found. Blog entries are stand-alone essays. This book is not a series of essays, as some books are, but rather walks the reader through a continuous narrative. It is framed as an intellectual journey, reflecting on my own journey towards skepticism. How people make ethical decisions is a very interesting line of psychological research. Perhaps the most well-known study is the famous trolley experiment. It is a theoretical question, if you are at the controls of a switch that can change tracks, and a trolley is out of control and heading toward five people that it will surely kill, would you switch the trolley onto another track that only has one person on it? Most people say that they will – they will sacrifice that one person in order to save five. However, if you are standing next to the track and a very large person is in front of you, would you push them onto the tracks in order to stop the train and save five people (just go with the premise for the sake of the ethical conundrum). Most people will say no. In scenario 1 they will sacrifice one person to save five, in scenario 2 they will not. Why? Conventional wisdom is that people are more willing to passively allow someone to die rather than actively kill them. The outcome matters less than the mechanism – emotionally, at least. The deeper issue here, beyond this one ethical calculation, is how we make ethical calculations generally. This mainly comes down to conflict resolution – when competing motivations are moving us toward different behaviors, how do we resolve the conflict? We make such ethical decisions on two levels, intuitive and analytical (the two basic modes of thought that have been elucidated in other contexts as well).